Today, AT&T announced that they are expanding their Wi-Fi calling feature to allow subscribers to make calls to the United States over Wi-Fi when travelling abroad. Starting now, if you travel overseas and use an iPhone 6 or newer, you can use Wi-Fi calling to call your US numbers free. Starting this afternoon, and following the iOS 9.3 update, AT&T began sending text messages to customers notifying them of the change. When traveling abroad, a call placed to the United States or received from the United States using Wi-Fi calling will incur no long distance charges, a feature that should be highly useful to AT&T customers who are visiting another country and calling home. 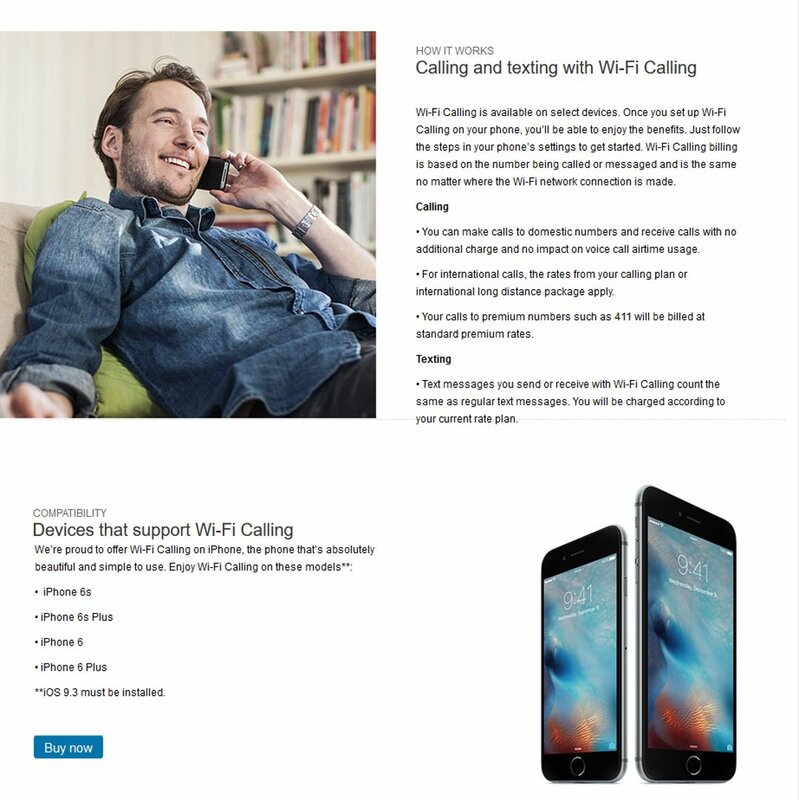 AT&T introduced Wi-Fi calling in October of 2015, allowing customers to place calls over Wi-Fi in instances where a cellular connection is poor. At launch, AT&T’s Wi-Fi calling feature is only available within the U.S., Puerto Rico, and the U.S. Virgin Islands. If your wireless network coverage is weak or unavailable in a domestic coverage area, and Wi-Fi is available, then your iPhone will switch to use Wi-Fi calling. However, if you are outside of a domestic coverage area and in a place with Wi-Fi then your phone will make calls using the Wi-Fi network. AT&T has updated their website with new text to reflect the updated capabilities. Use Wi-Fi Calling to talk and text over an active Wi-Fi connection. Wi-Fi Calling lets you talk and text from indoor locations where it’s hard even for a strong cellular signal to reach. Wi-Fi Calling can be used in the Domestic Coverage Area (U.S., Puerto Rico, and U.S. Virgin Islands) and from most international countries. The new international Wi-Fi calling feature is available on the iPhone 6, 6S, 6 Plus, 6S Plus, and newly introduced iPhone SE, so long as iOS 9.3 is installed. AT&T is also notifying customers about a change to NumberSync, which now allows devices linked to an iPhone to make or receive calls over an AT&T cellular connection, something that was not previously possible. The NumberSync feature allows AT&T users to make calls and send text messages using their phone number from a device like an iPad or Mac even when their iPhone is turned off or in another location. Previously, only devices connected to Wi-Fi can use this feature. However starting today, a cellular iPad or other device with a cellular connection can use it to make NumberSync calls when a connected iPhone is unavailable. This change allows AT&T subscribers to place a call over the internet rather than through a foreign cellular network, meaning you will not be paying roaming fees. Please note that AT&T will still charge you if you call a non-US number, but only at the rate, you would pay if you call overseas while in the US. why are they not supporting Android? is it intentional?